Blessed are you, Lord, our God, Ruler of the Universe. We praise you for your steadfast love and for your mighty works in the world. Thank you for redeeming and restoring us, your church. Ignite our hearts to serve you and others more fully. Rejoice and be glad! God has been faithful to us. Despite the challenges and hardships we face, God continues to express love to us in profound ways. Overwhelmed by the goodness of God, it seems natural that we would respond with praise and gratitude. As we give thanks to God in this season, we continue a long tradition. The Israelites, after being rescued from difficulty and distress, were filled with gratitude and love for God. They rejoiced with heartfelt singing and joyful dancing. They gave of the best of themselves as an act of praise. Like the Israelites, there is much for which we can be thankful. Through the provision and love of God, the Church of the Brethren continues to share the peace of Christ. This year alone, God has done many great things among us. and advisors served in 19 workcamps. The Mission and Ministry Board has approved two new mission projects in Venezuela and in the Africa Great Lakes region (Democratic Republic of Congo, Rwanda, and Burundi). Inspiration 2017 (National Older Adult Conference). The Office of Public Witness helped lead a conversation with elected officials to raise concerns and propose ways to address the humanitarian and food crisis in northeast Nigeria. faithfully served around the world. And God will continue to do great things in the days ahead. On Giving Tuesday (November 28), join us in celebrating the great things God has done by making a gift to the Church of the Brethren. Thank you for rejoicing with us on Giving Tuesday! To make a gift to the Church of the Brethren for Giving Tuesday, visit www.brethren.org/GivingTuesday . A workcamp in Kyle, S.D., international mission work in the Democratic Republic of Congo, and Christian Citizenship Seminar 2016. Photos by Jennifer Coale, Christian Elliot, and Kendra Harbeck. “Each of you must give as you have made up your mind, not reluctantly or under compulsion, for God loves a cheerful giver. God is able to provide you with every blessing in abundance, so that by always having enough of everything, you may share abundantly in every good work” (2 Corinthians 9:7-8). God is generous. Though each person witnesses this quality in different ways, we all experience the abundant, unwarranted, and wonderful blessings of God. God is so gracious, providing all that we need, and in many cases, giving us more than we could imagine. As we give thanks to God, we also have the opportunity to share what we have received. The abundant gifts in our lives are not only meant to bless us and our families, but also the church and the world. Though our culture is filled with consumerism and over-spending during the holidays, Giving Tuesday is a reminder that there is more to the story. As we give, we partake in the generous and gracious giving of God. 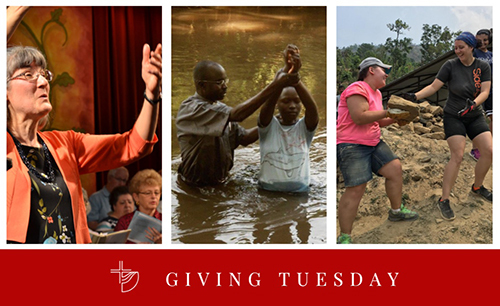 As we celebrate Giving Tuesday on November 29, we invite you to consider how God may be leading you to give to the Church of the Brethren. All gifts to the denominational ministries of your church support life-changing opportunities that share the love of God. Learn more about Giving Tuesday or give now at www.brethren.org/givingtuesday.